All too quickly we had to say good bye to our colleagues in Lithuania and get on the road to Latvia. 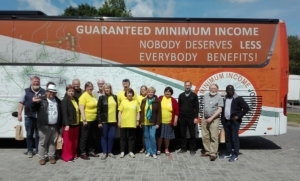 Around mid-day we were greeted by an enthusiastic group of EMIN volunteers and city officials in the town square of the city of Bauska. The National TV channel was also there to record the event. Our colleagues from Latvia had a meeting with the social services department of the city that morning. 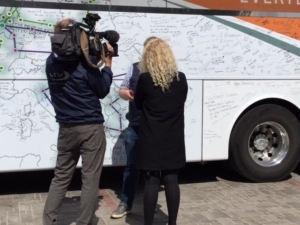 We arrived at the end of the meeting and had only a brief opportunity to engage with the city administration and to pass on our #eminbus message. It was then on to Riga, where the bus is parked for 45 hours on the busy square in front of the Central railway station. 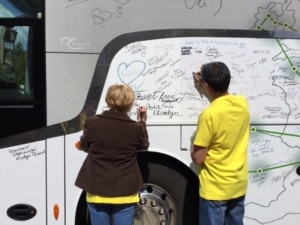 There was a steady stream of people passing by who interacted with the volunteers and many were pleased to sign the petition. Representatives of two political parties were also present as was media. Tomorrow we will have a full day on the square. 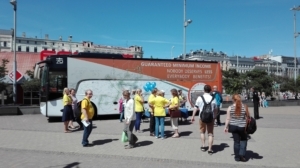 We look forward to learning more about the reality of Minimum Income in Latvia.